from paragliding and climbing to sailing and scuba diving or even, for a few weeks in the year, skiing on the snow capped Troodos Mountains. Air sports With its excellent weather and varied terrain and coast, Cyprus is ideal for flying, gliding, parachuting, and windsurfing. For general information contact the Cyprus AirsportsFederation or call on 00357 22339771 . Climbing and hiking Popular sites for rock climbing/bouldering include Eagle Rock and the Chassamboulia rock in Paphos District and Cave Greko near Agia Napa. For detailed information on climbing, contact the Cyprus Mountaineering and Sport Climbing Federation on 00357 97770067 . For hiking there are numerous marked trails in the Troodos Mountains. A section of the European Long Distance Path E4 travels for 539km the length of the island, and there is 322km of good walking divided into 72 nature trails. An excellent booklet on the E4 Long Distance Path and the nature trails is available in CTO offices in Cyprus and abroad, as are trail guides produced by the Ministry of Agriculture’s Department of Forests. The best general walking in the north is in the Kyrenia range and along the Karpaz Peninsula – look out for the tourist office’s excellent trail guides Kyrenia East and West and Karpaz East and West. Also Check out the Polis area. Cycling has been enjoying a huge boost in popularity in Cyprus, both with amateur hobbyists and professionals. Cycling is a year-round activity, but conditions are best in spring and autumn. Mountain and road bikes can be rented in all main towns and holiday areas (there is a guide rental/day). For further information look out for Troodos Cycling Routes map available in tourist offices, contact the Cyprus Cycling Federation, or check out bikincyprusadventures.com. Fishing, both in the sea and in freshwater (the latter primarily in reservoirs), is popular in Cyprus. The main source of information regarding angling in the south is the Department of Fisheries and Marine Research or call 0035722807807, who publish a booklet on the subject.. It is possible to get permission to fish in reservoirs, but is probably not worth the effort. Football is strongly supported across the island. The Cyprus Football Association runs a full league of four divisions with fourteen clubs in each, and there are three cup tournaments.Admission prices are a fraction of what UK league teams charge, and tickets can be bought at the ground, on the day. Despite being relative minnows, Cypriot clubs have reached the group stage of the Champions League three times in recent years, and and a few years ago Lefkosia Apoel became the first to reach the quarter finals. Horse Riding There are numerous horse riding stables in Cyprus, and many offer holiday packages. Two of the best are Ride in Cyprus, based just outside Paphos, and Drapia Farm in Kalavasos (book through cyprusvillages.com). Skiing Though it might seem unlikely, from January to March there’s usually enough snow on Cyprus’s highest peak, Mount Olympos, to allow skiing. The Cyprus Ski Club or call 00357 22449837 operates a ski centre on the mountain with four ski lifts serving three slopes: a chairlift on Zeus slope, and T-bar lifts on Hera, Aphrodite and Hermes slopes. Tennis There are hundreds of tennis courts across Cyprus run by the municipalities as well as many hotel courts. Most have all-weather surfaces and are floodlit. There are numerous local tennis and beach tennis tournaments, and, during the winter, the Cyprus Masters Cup and Aldiana Seniors Open tournament. Cyprus also plays in the Davis Cup. For further information contact the Cyprus Tennis Federation or call 00357 22449860. Water Sports in Cyprus and diving The main coastal holiday areas, in both north and south, all offer the full range of water sports, either through centres on or near the beach, or through the big hotels. Dive schools in both the south and the north offer accredited courses. 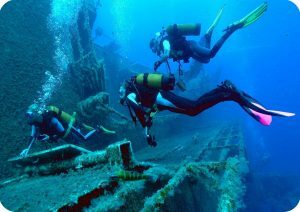 Among the numerous recognized dive sites are the wrecks of the Vera K and the Achilleas off Paphos and the wrecks of HMS Cricket, a British army helicopter and, most famously, the Zenobia off Larnaca. For scuba diving, contact the Cyprus Federation of Underwater Activities or call 00357 22754647. Sailing is widely catered for, either within the island or visiting – there are many ports, marinas and fishing shelters from which to choose. For charters, try Cyprus Yacht Club or call 70002677 in Limassol, Cyprus Yacht Charter or call 00357 24665408 in Larnaka or Cyprus Yacht Charters or call 00357 26910200 in Paphos.